When surgeons enter operating rooms at MidState Medical Center, a state-of-the-art hospital in Meriden, CT, they take on two critical roles. Their primary responsibility is patient health, but the second role they have is to demonstrate best practices and procedures in front of a virtual classroom. Two specific operating rooms—the Hybrid OR and the Robot Room—at the medical learning facility enable a global student audience to observe surgical procedures through videoconferencing technology. Two specific operating rooms—the Hybrid OR and the Robot Room—at the medical learning facility enable a global student audience to observe surgical procedures through videoconferencing technology. 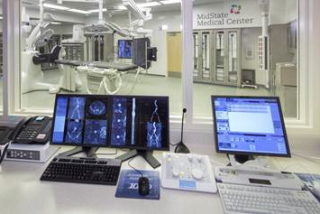 When Gary Blumberg, Hartford Healthcare Collaboration services manager at MidState Medical Center, was charged with selecting audio equipment for the new, advanced operating rooms in 2013 he had very specific, nonnegotiable requirements. To avoid the heavy RF interference caused by the hundreds of surrounding medical devices, Blumberg knew he’d need a system with cutting-edge wireless technology. For patient privacy purposes, he also required reliable and advanced encryption capabilities. Headsets that were comfortable and lightweight were also critical, which required Blumberg to be selective about the headset chosen—as he knew doctors wouldn’t have an opportunity to adjust the microphone during surgery. After witnessing the advanced frequency coordination, monitoring, and control available with the Shure ULX-D Digital Wireless System and Wireless Workbench 6, Blumberg enlisted Viju Group and decided to install four channels of wireless. He was also confident that the system’s AES 256-bit encryption would provide secure wireless transmission and protect patient privacy. To give students an opportunity to engage directly with the experts after each procedure, Viju Group also installed the Shure PSM900 Wireless Personal Monitor System in the operating rooms. Two-way communication between medical students and physicians is coordinated by a control room technician, who facilitates the discussion from a Shure Microflex 418 Gooseneck Microphone.